The first female Beauceron to achieve an AKC Championship conformation title. Sonata, the top producing female Beauceron in the United States. The first Beauceron dog to win the AKC title of Grand Champion. The Best of Breed dog and the Select dog of the 2010 American Beauceron Club’s National Specialty. Breed working and champion Beaucerons. Provide service dogs as well as show dogs. Train service dogs and their handlers. Train all breeds but specialize in the Beauceron. The Beauceron is a large and versatile herding dog from France. They are highly trainable, and are commonly used both in competition (agility, show, Schutzhund, French Ring) and as working dogs (police, military, search and rescue, herding, service and assistance dogs). They have a strong sense of family, and are highly trustworthy. A Beauceron grows to an average weight of 90 pounds for males and 75 for females. Their hair is of medium length, somewhere between a Doberman and German Shepherd, and their markings are similar to those of a Doberman. Although Beaucerons can come in all the colors seen in the Doberman, today’s Beauceron clubs recognize only two colors, the Black and Tan seen above and the Harlequin (merle). 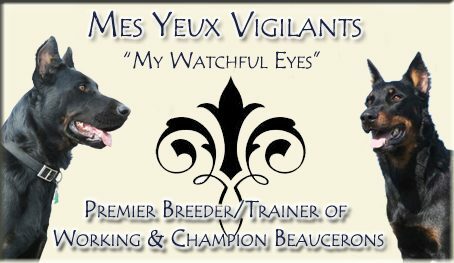 I hope that you enjoy your visit to Mes Yeux Vigilants, the home of champions. Please don’t hesitate to contact me with any questions.